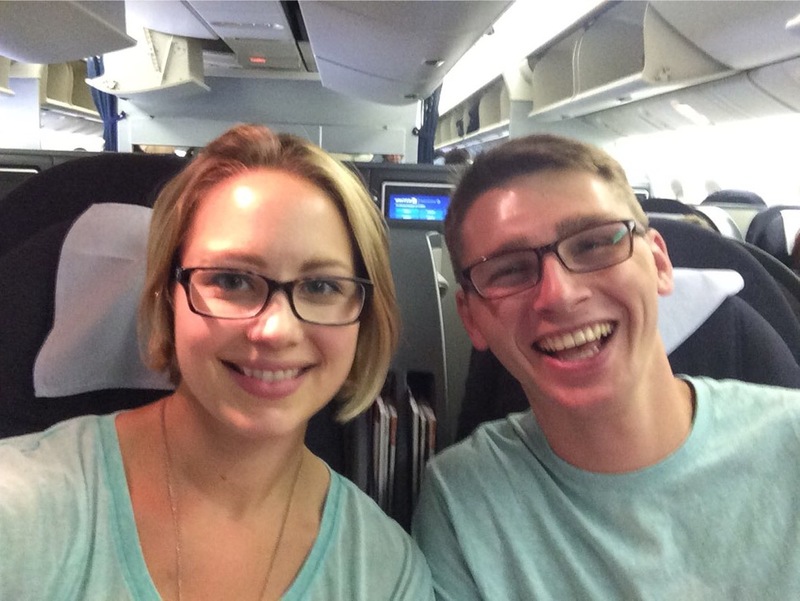 Last week, I went on a trip with my mom and brother, Josh, to Rome. For the day. I left Buffalo on the zero-dark-thirty in the morning flight to DC, where Josh picked me up and took me to our parents’ house to hang for a few hours until our flight to Rome. Along the way, he bought me Starbucks, opened up doors for me and divulged he intends to run for sophomore class president at Liberty University in the fall. Then, my other brother, Aaron, wanted to take me to his new favorite coffee spot in Manassas, Jirani Coffeehouse, where we enjoyed sandwiches as an early lunch. Who ARE these pseudo-adult, conversational young men who about three seconds ago were overgrown toddlers, waffling between tears and pummeling each other?! Josh and I got seats next to each other in Business (praise God–it’s like a nine-hour flight) and we watched a movie together before he conked out. Flights with mom are always fun; the entire crew knows who you are and treats you like gold, and it’s fun to see her in action. She’s definitely the life of the party–joking around and making sure work doesn’t feel too much like work. After we landed around 8 a.m. local time, we rode the bus with the crew to their hotel where fresh croissants and a cappuccino machine awaited. We changed clothes, made a quick stop at a local grocery store for cheap wine to bring home and breakfast for the next morning, before heading out for the day. I’m almost ashamed to admit it, but our first order of business was to get me the beloved souvenir I DIDN’T get when Andrew and I visited Italy in 2013: a mywalit wallet. Three years ago, I fell instantly in love with the rainbow-colored leather products and practically drooled over them our entire trip. They’re made in Italy and obviously on the pricier side (but still probably less than Coach), so I didn’t end up getting one. Well, I didn’t end up getting one this time, but it wasn’t for lack of trying; the only retailer we found didn’t have a large selection and I chose not to purchase without being sure of the one I wanted. Again, to Italy, I must go! 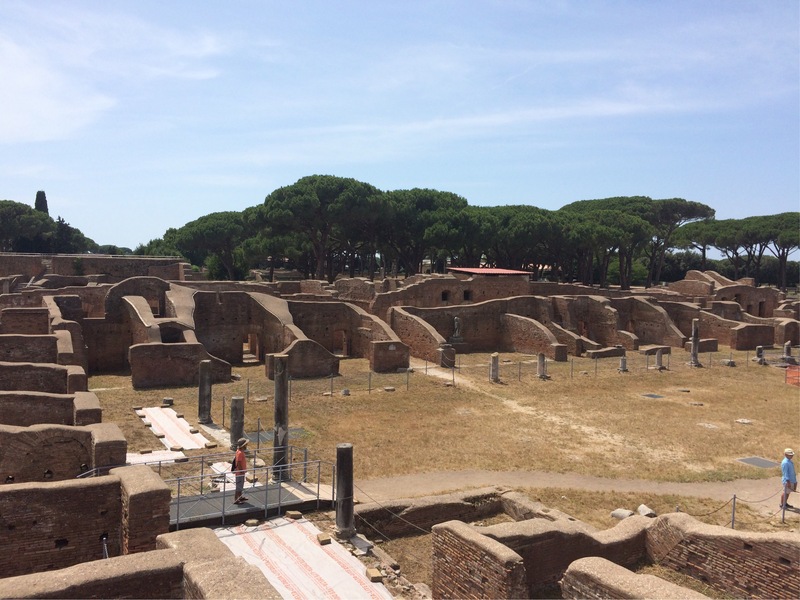 We jumped back on the metro and then to a train to get to Ostia Antica, a ruined city similar to Pompeii and a Rick Steves must-see. Surprisingly, Andrew and I didn’t make it there on our previous trips, so he suggested it as a possible activity. Having visited Pompeii as well, I can assert that it is indeed better preserved and Rick’s walking tour is very enjoyable. I can’t wait to bring Andrew here next time we visit Italy! 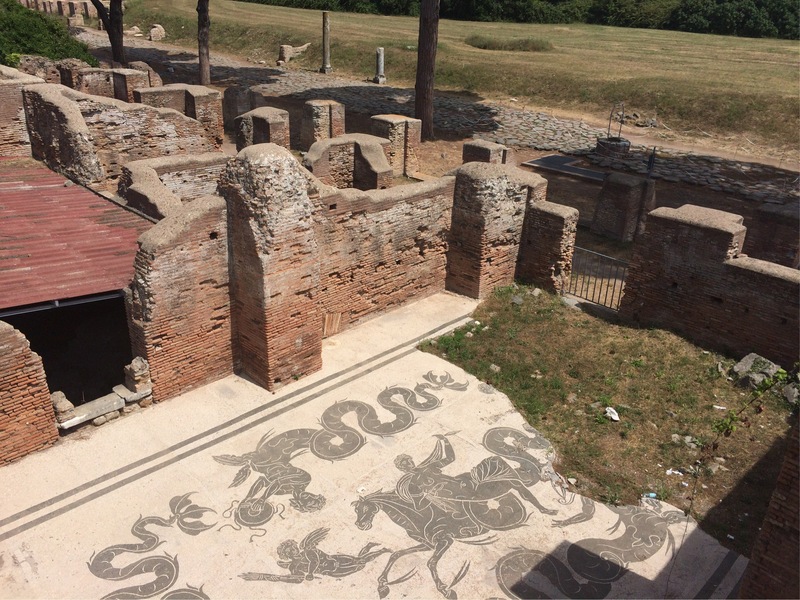 We were pretty burned out after walking around Ostia in the heat, so we headed back to the room for showers before dinner. Along the way, we walked the Via del Corso, a pedestrian-only shopping district and by the Pantheon, because, you know, it’s THERE. In the middle of a busy square stands this amazingly old structure that all but transports you back to the time of togas and sandals. It’s a simple coincidence that the emperor, Hadrian (our dog’s namesake) finished the building in 126 AD. Our first stop was the ‘Steelers Bar.’ No idea if that’s its real name or not, but the inside is covered in Pennsylvania paraphernalia–including a Penn State flag(!! )–and seems to be the local hangout for ex-pats, airline crews and perhaps even some tourists. We sat with some Air Canada pilots and sipped our drinks: Stout for me, cider for mom, moscato for Josh. (He thinks he’s SO COOL because he gets to drink overseas.) Speaking of drinking… I discovered a new favorite drink: an Italian ‘spritz.‘ It’s made of Prosecco, Aperol (made of bitter orange, among other things) and club soda. It has a surprising flavor that grows on you. Lucky for us, the EuroCup was on and it was a great game. Dinner was next door to the bar and just off the Piazza Navona, a public square filled with locals, tourists, cafes and men peddling selfie-sticks, glow-in-the-dark frisbees and caricature drawings. It’s magical at night. Thankfully, all the stars aligned on this trip and travel was a breeze–which is not always the case. I’m already excited to plan another trip with my mom in August!